There are not many small Swabian villages in Banat left in which young people still participate in the parish fair activities. Sântana is an exception. Here, the youth likes to celebrate the religious festival, a tradition which is not only part of the history of the Banat Mountains. Originally, the regional would hold a carnival which today only exists in Dognecea. The parish fairs in the Banat Mountain village such as Anina, Wolfsberg or Brebu Nou were imported from the Banat heathlands in the 60s and 70s of the last century. During the celebrations the boys are wearing a hat, which has been, decorated bei “their” girl. The girls wear elaborate braided hair and traditional costume. The starched and pleated skirts are very heavy and the girls cannot sit down during the ceremony. Traditional parish fairs usually have a special bouquet. Sântana has three of them and auctions them off for the benefit of the parish fair association. The fair has a different programme in every village. The way the decorated tree is positioned, how a bottle of wine is hidden in the ground and when last year’s bottle is dug up again, the barrel, to which the leading dancers and “Prime Financier” have to toast to and the auction of hats, scarves and bouquets – every village had their own traditions. 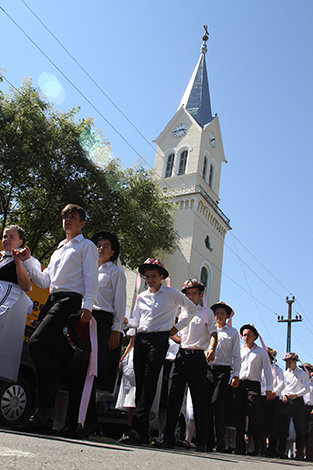 Sântana still maintains its old traditions lovingly and the councilmen are very proud of “their Germans”. Older boys in front of the church.